Here are our top 10 tips on creating a killer consulting resume. Before we get started, here’s one secret to how management consultants look at resumes – their primary criteria are STRONG ACADEMIC PERFORMANCE, STRONG WORK EXPERIENCE (includes extracurriculars if you’re still in college), and LEADERSHIP. There are variations, of course – leadership can be defined as taking leadership roles within organizations and companies, but also as risk-taking (for instance, starting a company or new student group on campus). You get the idea. 1) Read your resume for typos. Then read it again. Then have a friend read it. Then read it again. It is CRITICAL that there are no mistakes of any kind – grammar and spelling both. While you think mistakes can be overlooked, the funny thing about consultants (and this applies to other industries as well) is that once they find a mistake, it’s all they remember. Last year, I was doing a consulting resume review and noticed someone had misspelled “consulting” into “consluting”. While the rest of the resume was good, I didn’t forget this typo – and when we were on a resume review call, the team lead brought it up, and you know what? EVERYONE ELSE ON THE PHONE had noticed it too. 3) Put your name in a LARGE FONT. This is often overlooked, but DO NOT put your name in the same font size as the rest of the resume. If your consulting resume is typed in standard 12 font size, I would recommend a name at least 24 font size. Why? Because consulting recruiters/interview screeners can churn through 200-300 resumes within 3-5 hours (giving 1-2 minutes per resume at most!). The last thing you want is for them to mentally think “hey, this person is fairly qualified”, move on to the next resume, and then FORGET YOUR NAME. But there are MANY CONSULTING APPLICATION SITUATIONS where this will be helpful – think boutique firms, random resume drops, headhunters, etc. You want your name to STAND OUT so people connect YOU with your QUALIFICATIONS. 4) Make sure your contact info is UP TO DATE and you check your email FREQUENTLY. I’ve heard horror stories of applicants for financial service jobs submitting resumes with emails that bounce, phone numbers that are disconnected, and so forth. While the firm may eventually get in touch with you, a first impression is set and you’ll get off to a bad start. Use your MAIN EMAIL ADDRESS and a WORKING PHONE NUMBER. As a small but subtle detail, try to avoid outdated email domains (like AOL or HOTMAIL). Consultants pride themselves on being technologically savvy, and seeing an applicant with a [email protected] address raises several questions, such as “does this guy still use dial-up?”; “has she not heard of gmail?”; and so forth. Remember, readers – covering ALL BASES is the name of the consulting recruiting game. 6) Keep it to ONE PAGE and ONE PAGE ONLY. Obvious to some, but a VERY COMMON MISTAKE. Nothing says “I don’t know what I’m doing” faster than a 4 page resume. We have clients whine to us all the time, saying “but I’m overseas and we LOVE 3-page CVs. It’s what we do here.” Sorry – consulting firms STILL have a 2-page MAX even outside the U.S. Don’t push it, and still make it concise and focused. If you absolutely CANNOT fit the things that you want to say to one page, play around with font-size, line-spacing, character-spacing (all features within Microsoft Word). But I guarantee you should be able to unless you have 8+ years of experience. And leave white space! Do not make your resume too “text-heavy”. 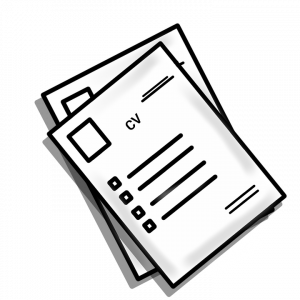 Interviewers are quickly turned off by resumes that are packed with content. This will make them less interested in reading your resume AND cause them to overlook important pieces. 7) Have a line on personal interest/hobbies and keep it SENSIBLE but SPECIFIC. One line only. Interests: competitive tennis player. avid hiker (climbed Kilimanjaro last year). amateur pastry chef. Interests: likes to play lots of sports. loves hiking mountains and has hiked kilimanjaro in the past. enjoys cooking. 8) Focus on RESULTS. Preferably QUANTIFIABLE RESULTS. Consultants are very “results-oriented”. They will be looking for similar attributes in your resume. Not every impact has to be quantified – but consistently focus on the IMPACT of your work and not the PROCESS, a very common mistake. This will convey that not only did you get work done, you did IMPORTANT work that showed CLEAR RESULTS for your employer. High-five. 9) DO NOT INCLUDE HIGH SCHOOL INFORMATION – SAT/standardized test scores are an exception. Whether you just graduated college or have 10+ years work experience, high school information DOES NOT belong on a professional resume. Place your SAT/standardized test scores in your “College” section. If there are MAJOR awards/prizes received while in high school (and this is only of the Westinghouse Science Prize magnitude), you can place them in the “College” section. An “Elks Lodge Scholarship” does not count. 10) Focus on the RULE OF THREE – 3 major work experiences, 3 bullets on each one. Simple “guiding principle”. Only exception is your PRIMARY job (the one experience, hopefully that’s most recent, that you would like to highlight to any resume reviewer) – you should have more than 3 bullets. Have an “EDUCATION” section with 3 bullets. And so forth. This rule ensures you don’t include 8 bullets for each experience, which is a sure-fire way to signal that you don’t know what you’re doing and overwhelm the reviewer with unnecessary information. We offer hands-on coaching sessions to help you break into management consulting and top business jobs – from re-writing your resume to simulated interviews/case studies to thorough Q&A. You’ll learn everything we know about recruiting for and working at the top businesses in the world.